The creation of a ‘can-do’ attitude, employee flexibility and a singular focus from the workforce on the achievement of a company’s goal has become the Holy Grail of modern management. Much has been written and read on managers and by managers on the subject. Millions of hours have been spent in seminar rooms and on training courses; and a great deal has (of course) changed for the better as a result. The hard truth is however, that in many cases the good work and positive intentions of the leadership are being undone and undermined by pockets of resistance in the workforce. The difficulty in weeding these out and dealing with them is that they don’t stay in one place. These are not terrorist cells with a mission to bring the company down. They are in fact (mainly) good hardworking employees who don’t intend to do damage and are unaware of their impact on the business. One day they may be a model employee and the next (without warning) they toss an emotional grenade into the very heart of the business. The ‘one size fits all’ approach of training and the application of pressure on managers to micro-manage every aspect of employee performance clearly isn’t working to deal with this issue. The Harvard Business Review* describes ‘a place where more energy may be put into thwarting things than starting them, but in the nicest way’ as a Passive-Aggressive Organisation. This description may go some way in putting into perspective the reality I’m describing. The healthiest companies are recognised as being resilient and resourceful; in other words their employees are flexible and quick to adapt. What makes them this way is not the provision of external resources but their internal emotional resourcefulness. While it is common to complain that progress is thwarted by a lack of cash or labour, it is not in fact a lack of ‘resources’ that holds most companies back, but a lack of employee resourcefulness. With low levels of performance and high levels of passive-aggressive behaviour any attempt at ‘tinkering’ with the existing processes is likely to be futile. Organisations in this situation require a radical overhaul that may even extend to their being dismantled and reassembled in a new form. Organisations with low levels of performance but high levels of active-compliant behaviour by the workforce are unwell and in need of recovery; they are ill but can be made better. This is normally a case of the workforce being willing and strong but the concept, product, processes or market being weak. 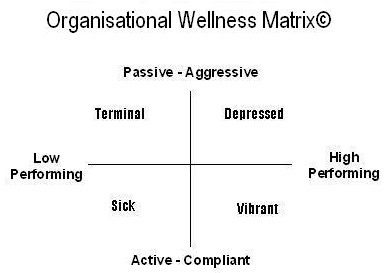 Organisations with reasonable to high levels of performance struggling along with a constant battle against the passive-aggressive nature of (some of) the workforce may find it difficult to stay focused on the positive aspects of their being; so absorbed are they in constantly keeping the ‘dark forces’ under control. With high levels of performance and an active-compliant workforce is it any wonder that organisations in this state are forward focused and benefit from the rewards their success brings. Clinical depression and organisational depression have much in common. In the case of the former the condition is brought on by a chemical imbalance in the brain. The person suffering from the condition has little conscious control over the feelings and consequential actions that result. Undiagnosed, the condition will deteriorate and may reach a critic stage, potentially leading to self harm. When identified, the condition can be treated by both the introduction of a chemical support that facilitates the brain functioning more positively and teaching the person how to manage themselves in a way best suited to producing positive results. With the latter, an organisation may be consciously doing everything it believes is in its power to operate in a positive and progressive way but because of the endemic passive-aggression that lives within it, is going to constantly struggle to reach any appreciable level of vibrancy. Left undiagnosed, this organisation depression will inevitably get worse. According to the Harvard Business Review* ‘Most passive-aggressive organisations don’t start out full of entrenched resistance. Problems develop gradually as a company grows, through a series of well-intended but badly implemented organisational changes layered one upon another. Passive –aggressive organisations are, therefore, most commonly large, complex enterprises whose seeds of resistance were often sown when they were much smaller’. Just as a person finds it difficult to track back in their lives and find the cause of their depression, organisations will find it nigh on impossible to retrace their steps and discover the true cause of their malaise today. In both cases the cause is nowhere near as important as the remedy. To help raise itself out of the depression an organisation needs to inject a temporary bridge that will ‘lift’ both the spirits and allow new methods of processing to take place. It must then train itself to act in ways that support this new (more positive and flexible) approach. Also in both cases, the combination of training and temporary support can lead to remission from the symptoms and allow the ‘patient’ to go on to live a perfectly vibrant and healthy life, as if the depression had never happened at all. The Passive-Aggressive Organisation by Gary L Neilson, Bruce, A Pasternak and Karen E Van Nuys. What can you expect from an investment in Corporate Coaching? Probably for the first time in a person’s life they will be faced with someone who has NO OTHER AGENDA than their success. A manager has an agenda. A Human Resource specialist has an agenda. Even a spouse or close family member will have their own agenda and want their ‘advice’ to be taken seriously. A coach has no agenda other than the success of the client. A coach will never tell a client what they should or should not be doing. A coach will never proffer advice. A coach uses sophisticated communication skills to help the coachee change the way they behave or react so as to achieve a new result; new results that take them closer to achieving their goals. If anyone were to promise miracles then scepticism would be a reasonable response. Yet, the reality is that ‘challenging’ or ‘unfortunate’ behaviour is often accepted. The lack of a capacity to change is engrained in our culture; ‘a leopard can’t change its spots’. Sometimes we even support such behaviour by making excuses for it; ‘Better the devil you know’ is just one way of justifying our own lack of belief in the possibility that the person might be able to change. Nothing however could be further from the truth. Of course, everyone develops habits, but that does not mean that new habits cannot be formed. Changing behaviour habits is NOT the same as learning something new. I could attend a training session on the methods used to play a violin, and I may well be able to intellectually grasp those concepts, but it is highly unlikely that I’ll come away able to play a violin! That is why ‘telling’ someone to change their ways will not work. It’s also why ‘explaining’ why a change will be of great benefit will also not work. The person may well understand the concept at an intellectual level, but that will not help in changing their engrained behaviour patterns. They may ‘try’ to change, but at best such change will be fleeting and at worse they may feel so lacking in confidence to change, that they don’t try at all. It aligns these desires with the achievement of work related activity, and then establishes changes in behaviour that will lead the coachee closer to the achievement of their goals. It is focused on the future. It is positive by definition. It bridges the gap between personal needs and organisational necessity. Coaching succeeds where supervision and management has failed; not because the supervision was bad or the management poor, but because a different approach was called for; an approach that is difficult (although not impossible) for a manager to deliver. The nearer to the top of an organisation a person gets, the less likely it is he or she will have resources at their disposal to develop and enhance their own performance. Executive coaching provides senior individuals with a foil on which to sharpen his or her leadership skills and enhance their personal performance. At this level it is unlikely that additional ‘training’ is either appropriate or desirable – it is also highly unlikely that any senior executive ‘knows it all’ – particularly when it comes to the science of human behaviour and the study of behavioural change. That is why these sessions are highly valued and of such benefit to the executives who make use of them. If a senior person has ceased to perform effectively and more 'traditional' interventions have not remedied the situation then coaching may be an intervention of last resort. A turnaround intervention doesn't offer a guarantee of success but it does provide a platform from which the employee can be true to themselves about their own performance and make future decisions accordingly.